Decatur County borders the Tennessee River in West Tennessee and was established in 1845. Its name honors Commodore Stephen Decatur, naval hero of the War of 1812. Carved from land originally claimed by the Chickasaws, the area was part of the Jackson Purchase of 1818. Decatur County was initially part of Perry County, which is on the east shore of the river, but citizens on the western side petitioned the general assembly for a new county in 1845. In 1849 Decatur County gained an additional three-mile strip from Hardin County, making its total area 346 square miles. According to the 2000 census, 11,731 people live in the county. Largely rural in nature, Decatur County contains several small towns and communities. 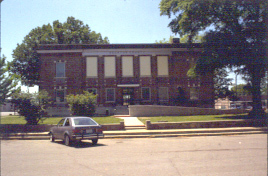 Decaturville, established in 1847 near the center of the county, serves as the county seat. The county’s largest town, Parsons, like many nineteenth-century communities in West Tennessee, developed around newly laid railroad tracks. In 1889 local entrepreneur Henry Myracle encouraged area settlement by donating 143 acres to the Tennessee Midland Railroad Company. Initially called Parsons Flat after Myracle’s son-in-law Dock Parsons, the town gained its charter in 1913. Perryville (1825) is the county’s oldest community. The mid-twentieth-century construction of the Gilbertsville Dam (Kentucky Dam and Lake), however, flooded the old town and forced many of its residents into Parsons. In 1971 Perryville’s post office officially closed, changing its status from town to village. Other communities in Decatur County include Bible Hill, Sugar Tree, Bath Springs, Scotts Hill, Tie Whop, Lick Skillet, Beacon, and Jeanette. Agriculture continues to provide the primary economic base in Decatur County; cotton and corn were the earliest staple crops. In the 1970s, as many farmers began dividing their time between the factory and the fields, soy beans, a less demanding crop, gained in popularity. Livestock, particularly hogs, also have been an important source of income in the county, with the principal markets in Decaturville and Scotts Hill. Since the 1960s area lakes have supported catfish farms and musseling businesses. Decatur County’s abundant resources have attracted several businesses. In 1846 Brownsport Iron Company established iron-smelting furnaces on 12,000 acres near Decaturville, where it continued operations until 1878. Limestone, which is plentiful throughout the county, supports a variety of gravel industries, and phosphate is found along the Beech River. The county is also rich in timber. Native hardwoods such as white and red oak, hickory, and tulip poplar supply local sawmills. Decatur County gained its first manufacturing plant in 1938, when Salant & Salant, makers of men’s work shirts, opened a factory in Parsons. It expanded from five to fifty operators in the first nine months, and by 1979 employed nearly seven hundred workers. Industrial development accelerated in the post-World War II era. By the late 1970s industries in Parsons included Kaddis Manufacturing Corporation, makers of machine parts; Decaturville Sportswear Company; and Thermo Dynamics, which manufactured refrigerators. A commercial refrigerator company, Kol-pak Industries, operates in Decaturville, as does Karlyn Manufacturers, an apparel producer. Kol-pak is now the county’s largest employer, while the textile companies have greatly decreased their operations. Transportation provided the key factor to Decatur County’s economic development. The railroad promoted settlement and initial development of the area. Trains made their first stops in Perryville in 1889 but had suspended service to the county by 1936. In the early twentieth-century road construction opened the county to industry. In 1930 the Alvin C. York Memorial Bridge opened at Perryville. The one-mile span over the Tennessee River made the county more accessible to automobile and truck traffic. The construction of a municipal airport, Scott Field, in Parsons, brought Decatur County into the age of air transportation in 1959.